Are there other technologies like it? 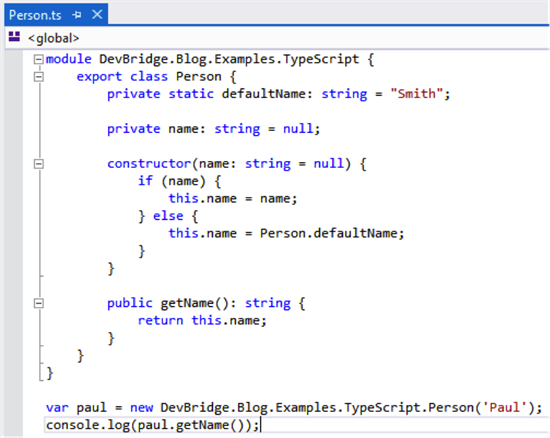 Visual Studio 2012 developers can install the TypeScript editor plugin to get rich TypeScript tooling inside Visual Studio. It is recommended to install the Web Essentials extension to get full support for TypeScript preview and compilation. 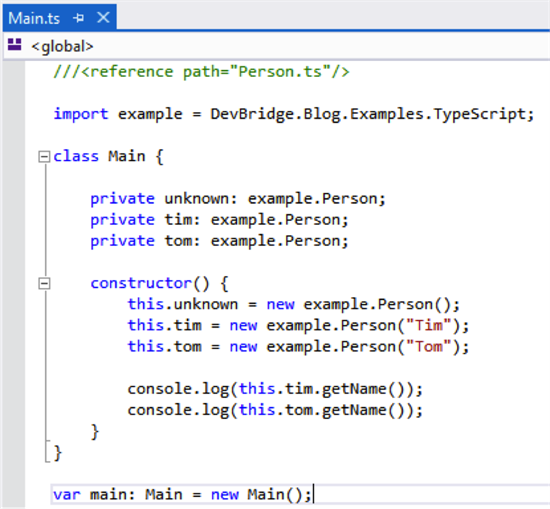 ReSharper 8 from JetBrains is going to support TypeScript, too. WebStorm/PhpStorm from version 6 introduces full support for the TypeScript language through the new Source Maps feature. I am going to talk about Source Maps a little bit later. 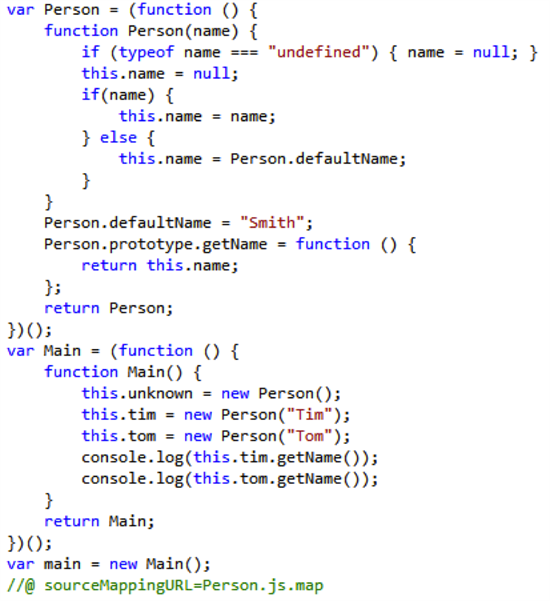 In the example below we have a piece of code in the TypeScript. It contains two classes: Person and Main. 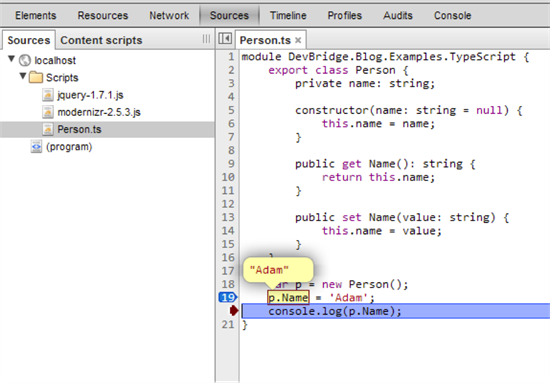 The first one has a constructor with an optional name parameter and a public method getName(). The other class Main uses a Person class and initiates two instances of it. 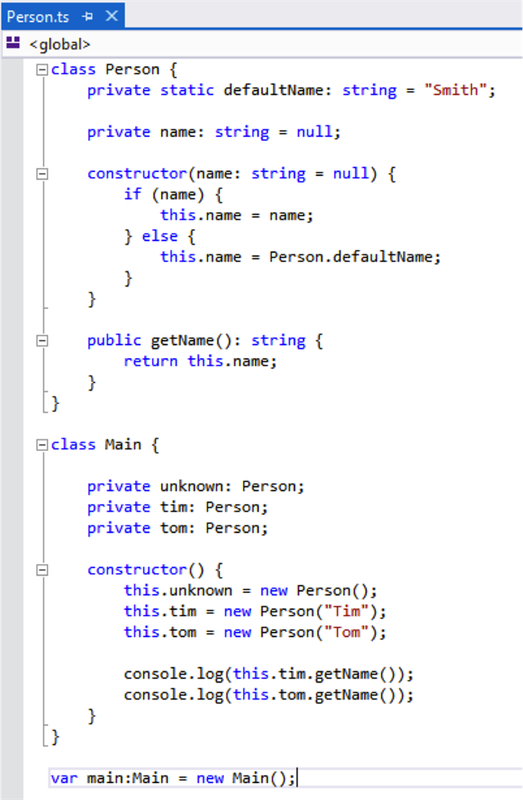 Pay attention to the static Person.defaultName member, which is used if Person’s constructor is named without a name parameter.  At the end of the generated file we see a //@ sourceMappingURL=Person.js.map comment. I will explain it a bit later. 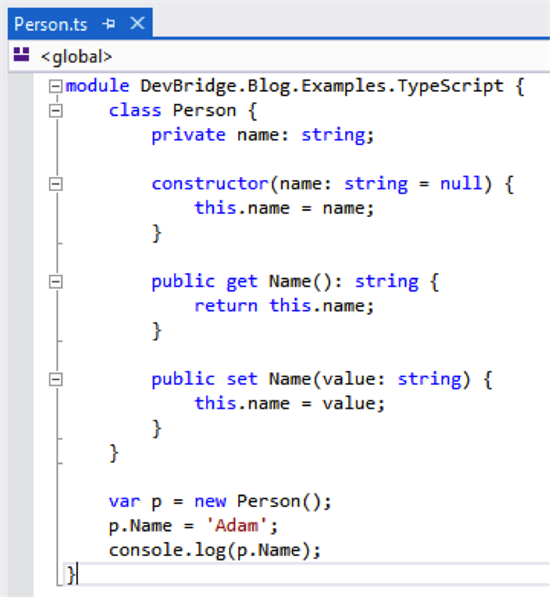 Namespaces are introduced using the module keyword. By default, the internal stuff in a module is not made visible outside of the module. To make it visible we have to use the export keyword. The void type, referenced by the void keyword, is used as the return type for functions that return no value. The only place the Void type may appear is in a return type annotation for a function. 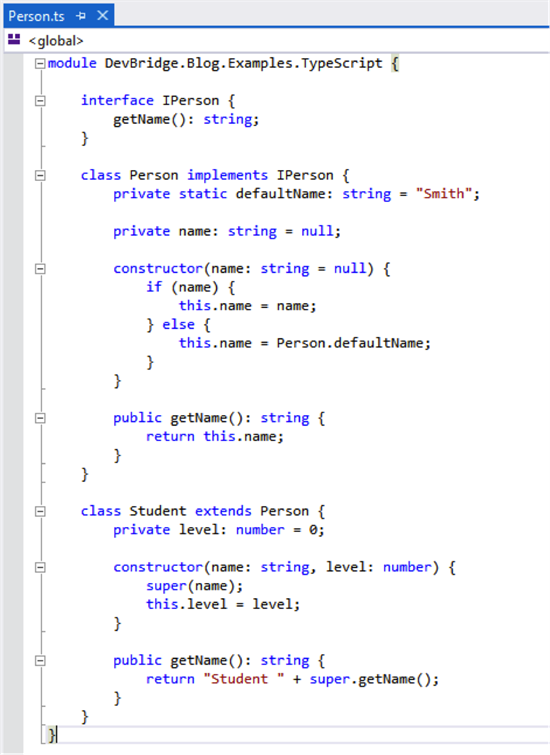 You should use a super keyword in the constructor of a derived class to pass parameters to the base class constructor. 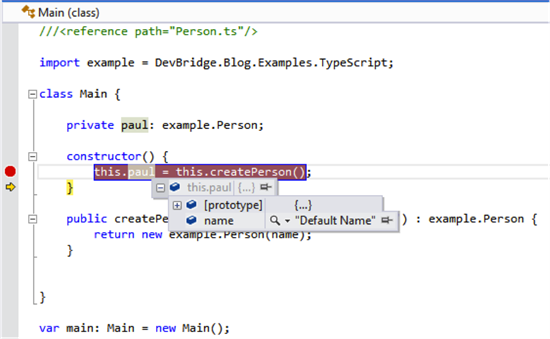 Super calls for passing parameters are not allowed outside the constructor in TypeScript, though you can use super keyword to invoke methods of the base class from the derived class. Members have either public or private accessibility. The default is public accessibility, but member declarations may include a public or private modifier to explicitly specify the desired accessibility. Below you will notice that there are two methods named Name. Notice the “get” and “set” in front of the methods. 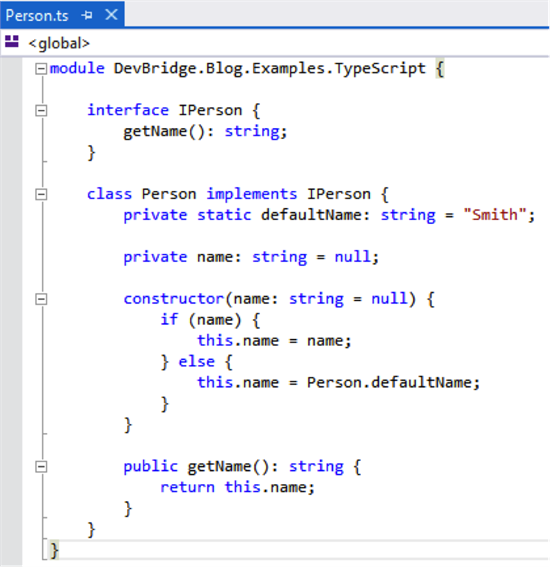 TypeScript Getters and Setters are called TypeScript Accessor. 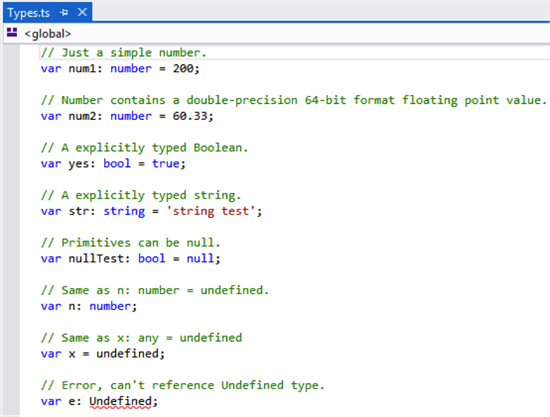 TypeScript supports arrow function expressions, a new feature planned for ECMAScript 6. Arrow function expressions are a compact form of function expressions that omit the function keyword and have lexical scoping of this. If you run a TypeScript enforced application with Internet Explorer, Visual Studio can do debugging right inside Visual Studio. 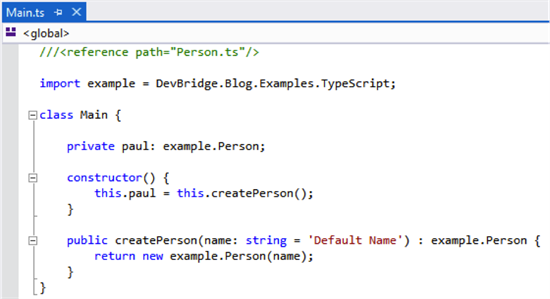 Now you need to enable the Source Map generation from the TypeScript file. First you need to compile the .ts file with the -sourcemap flag in order to generate a source map file. 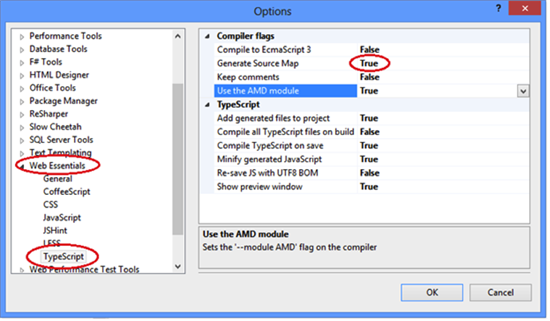 In Visual Studio you need to go to Options → Web Essentials → TypeScript and set the Generate Source Map option to True. As you can see - we have a regular debugging experience here!